NBC Denies Bob Costas’s Pink Eye Due to BotoxThe meme that launches a thousand cringes. The 2014 Sochi Winter Olympics GIF Wrap-upSoft knees, wrenched guts, can’t lose. The Best and Worst of Olympic Figure Skating Costumes Prince tributes, fake tuxedos, and a pantsuit Hillary Clinton would adore. Miss Thursday’s Olympic Games? Here’s a GIF-capDid they coat the Iceberg Skating Palace in Crisco or what? Whatever Happened to Olympic Medal Ceremonies?They’ve gotten rare in prime time. Norwegian Curling Team Has Fancy-Pants Crisis Replaces Russian missile crisis as most notable Russian crisis. #SochiProblem of the Day: ‘Wolf’ in Athlete Housing Was a Hoax [Updated]Calm down, it’s just a hungry wild dog. Miss Wednesday’s Olympic Games? Here’s a GIF-capBeauty and the biff. I Tried Curling to See If It’s Really a WorkoutCalorie-burning with a broomstick. Miss Tuesday’s Olympic Games? Here’s a GIF-capOne big weather advisory. Miss Monday’s Olympic Games? Here’s a GIF-capYesterday’s twizzle reel. Fog-Shrouded Sochi Must Wait for Snowboardcross, BiathlonAnticipation makes it sweeter, no? Bode Miller Breaks Down After NBC Reporter Repeatedly Asks About Dead BrotherAnd NBC airs the whole thing in prime time. Miss Sunday’s Olympic Games? Here’s a GIF-capOlympic dreams, and waking up from them. Miss Friday’s Olympics? Here’s a GIF-capSilver medals get some play. It’s a Tender, Tinder Valentine’s Day in SochiHot athletes need companionship, too. How Have U.S. Olympians With ‘Gold’ in Their Names Fared?Gracie Gold is a headline-writer’s dream, but she’s not the first. Miss Thursday’s Olympic Games? Here’s a GIF-capInjuries, new stars, and one raw egg. Russian Skater Plushenko Withdraws From OlympicsDue to injury. Delicious Upstate Yogurt Won’t Make It to U.S. Olympic Team How are they supposed to compete? Miss Wednesday’s Olympic Games? Here’s a GIF-capThe thrill of the Addams Family theme song, the agony of defeat. Putin ‘Cuddled’ a Queer Person in PublicAnd now the rest of the Olympics have been canceled. Bob Costas Still Looks Like a MonsterHe’ll sit out again Wednesday night with pink eye. Olympic Village Is Prime Tinder Territory, of CourseAlways a hookup hot spot, now with an app. Shoshi Games Takes Girls’ Shoshanna to the OlympicsIt’s an ode to Zosia Mamet’s glorious facial expressions. Big-Butted Olympians Have Problems With Denim A harrowing account of too much booty. So This Happened: Hitler’s Winter Olympics in PhotosSo many swastikas. Shaun White Did Not Three-peat at the OlympicsHe finished fourth in the men’s half-pipe event. Bob Costas to Spend 24 Hours in the DarkHis 157 straight broadcasts end tonight. Sochi’s Threat to Kill Dogs Gained It an Army of Volunteer Dog-CatchersBad press leads to cost savings. 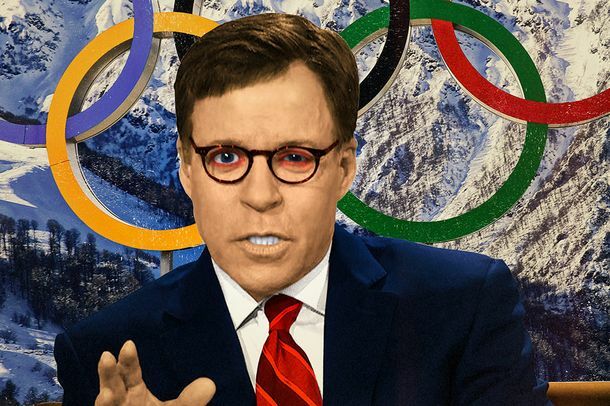 Bob Costas’s Olympic Eye Infection Got Much WorseHe’s turned to vodka. Miss Monday’s Olympic Games? Here’s a GIF-capYou will cry, and not just when you see Bob Costas’s advanced pink eye.